"Prepare this refreshing and tangy smoothie at night and blend in the morning for the best breakfast ever. For a sweeter smoothie, double the maple syrup or honey. 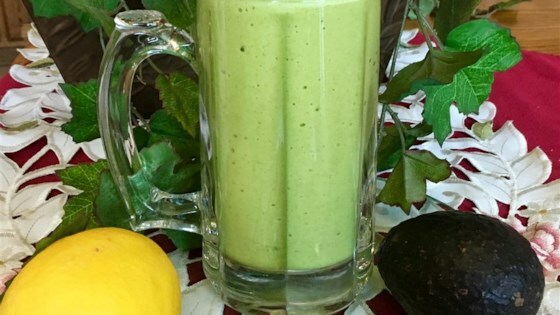 This recipe fits perfectly in a Magic Bullet® blender cup!" Combine spinach, banana, avocado, kiwi, lemon juice, mint, almonds, maple syrup, and flax seeds in a blender. Add enough water to almost cover ingredients; blend until smooth. Add ice and blend thoroughly. In addition to being surprisingly delicious, this recipe is ultra healthy. The avocado and almonds will keep you full. Try it every day for a week and see if you can resist on day eight! Substitute honey for maple syrup, if desired.